I’ve been using a Kindle for about 6 years. And have been reading paper books for longer than that! 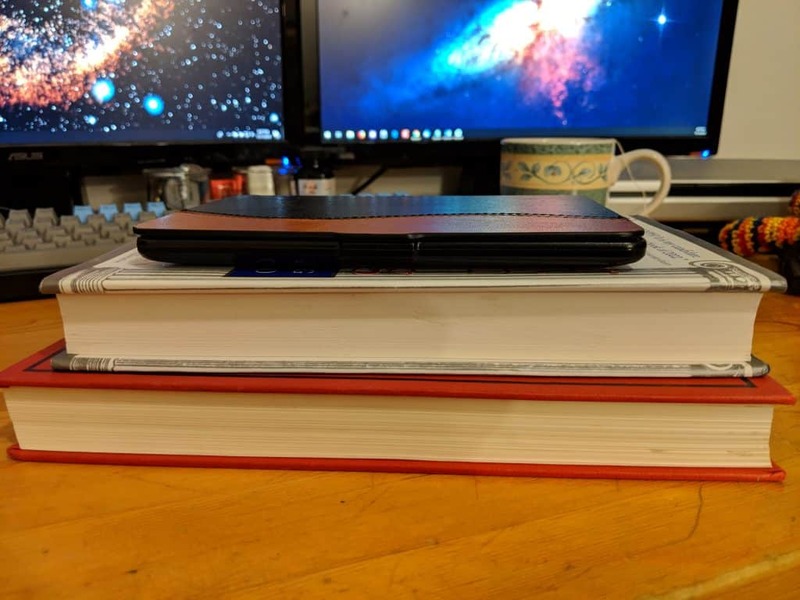 I have two Kindles, one is the discontinued Kindle Touch, and the other is the newer Kindle Paperwhite. 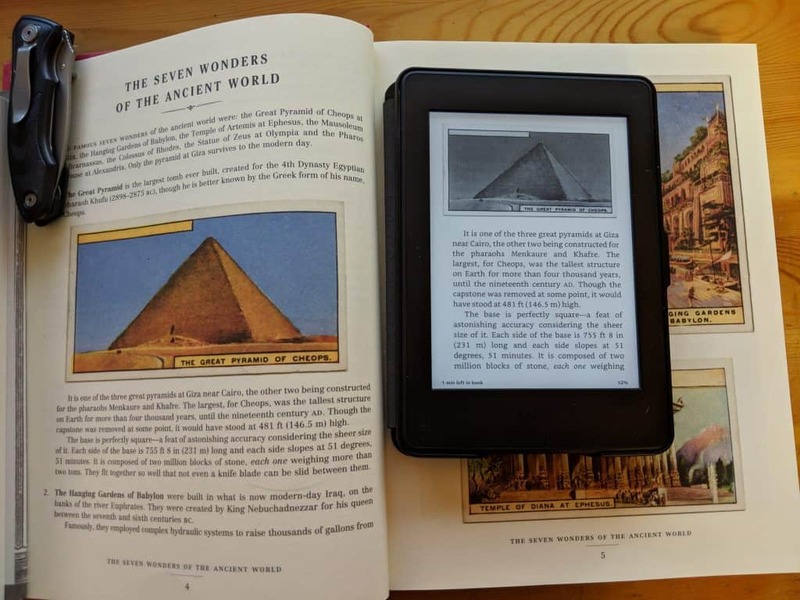 Here are my thoughts on the Kindle and how eBooks compare to Print Books. For much of the reading experience I prefer the Kindle. It’s compact, lightweight, and easy to carry around. With a kindle I don’t have to awkwardly hold a book open while my other hand is trying to not spill my cup of coffee. Also when it starts to dim outside and I don’t quite have enough light I can turn on the backlight instead of the house lights. So, e-ink displays don’t have as good of a contrast as real paper. The reason Amazon calls their latest Kindle the “Paperwhite” is it has a backlight that can sort of match the brightness of paper by supplementing the light from your environment–the idea is you turn the backlight on just enough so that it still looks like it’s reflecting light like a book, but there’s just enough extra light to make it as readable as paper. This does work, however I think the LED color Amazon chose is a failure. The pure white LED backlight is too much in the blue spectrum and that’s very obvious when I’m reading under incandescent lights. It’s okay in natural light but under incandescent lighting it should be warmer to match the surrounding atmosphere. This could affect health if reading right before going to bed. I hope Amazon fixes this in the next version…maybe it should have RGB bulbs and a sensor to match the ambient light. In very bright light paper wins out, but if the ambient light is dim as it often is in the Fall in Idaho the Kindle let’s me read a little longer before turning on the house lights. This probably saves me 1 or 2 cents a year. 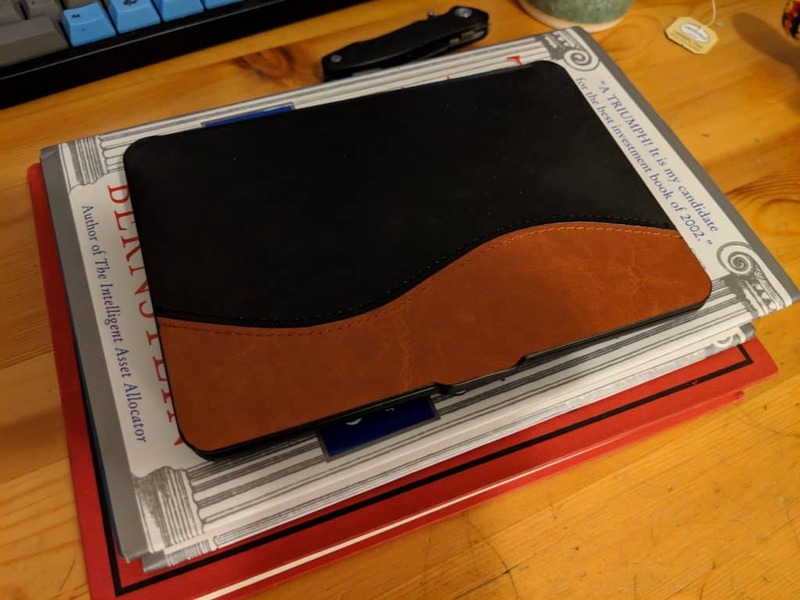 The Kindle does have the advantage of being able to store my entire Kindle library wherever I am… not only is it smaller than 99% of my books, it can store all of my books in that space. 90% of paper book publishers choose great fonts–but some don’t. For some reason some publishers think their book needs a sans-serif font, or they pick a huge font, or too small a font, or the kerning is not normal. It bugs me! If you get the Kindle version you can override the publishers horrible font decision. As an added bonus the font-size is adjustable so I can read anything without glasses. I always prefer a good hardbound paper book to an eBook, however I’ve noticed lately a lot of authors are using cheap (self-publishing?) services–it seems to me the books are printed on demand and the quality is sometimes bad–I’ve had books that–the best way I can describe it is the book feels like I’m holding some ad-hoc document put together at a business conference rather than a book. I’ll often opt for an eBook if I see the author is using a self-publishing service (not all self-publishing books come this way–I think it’s just a quality control issue so it’s a hit and miss). The social aspect of eBooks is poor. Often when I’m on an airplane or a friend is at my house they’ll show interest in a book I’m reading or I have on the shelf and it makes a great conversation starter. You just don’t get that with Kindle books because nobody can see what you’re reading. Kids love physical books and will spend hours poring over maps, illustrations, and pictures which would be boring on a tablet. I can easily give a paper book to a friend. While Amazon has some provision for lending it’s very limited and it’s not as simple as handing your friend a book. For highlighting it’s a wash–the Kindle is sometimes a bit finicky when I try to highlight a passage and sometimes gets the wrong portion highlighted but for the most part I can get it. I always read a book with a pen or pencil but I find underlining a passage without the line going through the words to take a little more effort. For taking notes in the margin nothing can beat pencil or pen on paper. Diagrams are pictures are generally bad on eBooks. For simple graphics it does fine. But if the book has illustrations they don’t look as great because the screen is smaller and you lose color. 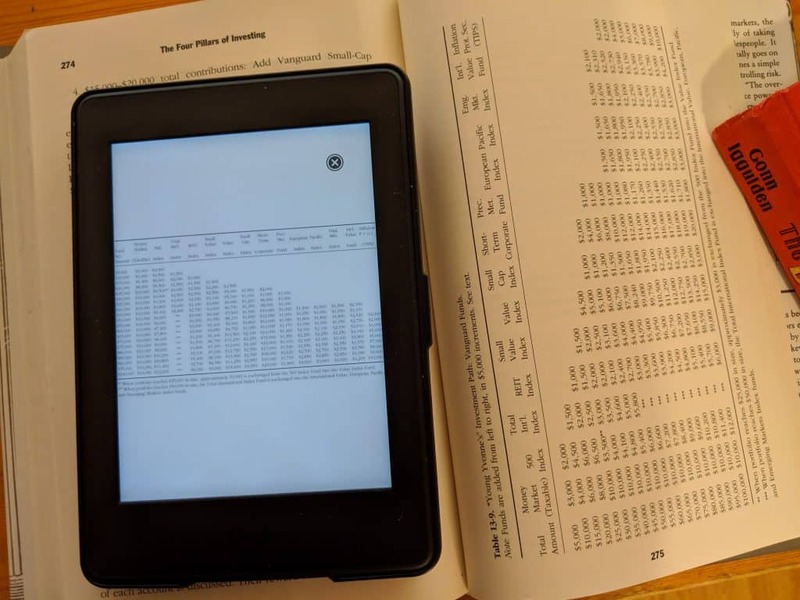 Also, the Kindle completely fails at tables… this table below has data that is illegible on the Kindle… it’s too small to read and there’s no way to rotate it into landscape mode. The Kindle is useless here. Even in the flip through the pages mode the e-ink display takes too long to refresh. 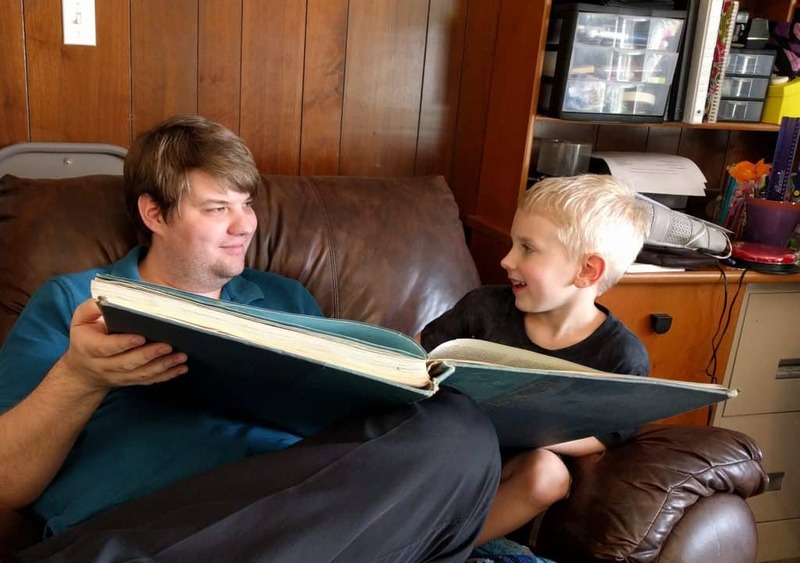 A real book is much easier–plus I remember the layout of a page and generally know what I was looking for was in the 1st quarter of the book so can find it in seconds. Here the Kindle shines. If you are looking for a keyword or phrase you can find it very quickly. This is a big deal. I am very spacial and use the physical feel of how many pages I have read and how far to go as part of my memory. This is all lost on eBooks. With paper books it’s easy to see your overall progress at a glance, and if you want to thumb a few pages ahead to see when the chapter ends it takes half a second. With an eBook I get something like location 675 or 24%. That’s meaningless to me. A progress bar might be nice! Something visual and not just numbers. Even web-browsers have scrollbars! 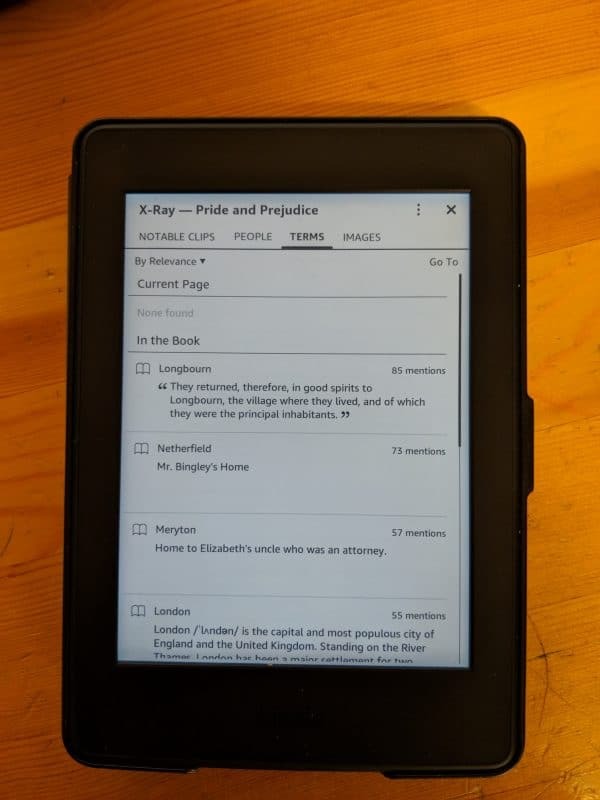 When reading books for study with others eBooks fail–I tried this once but everyone else was referring to page numbers and I couldn’t get page numbers out of my kindle. Amazon has a lot of free Kindle books for Prime members. I’ve found the free books aren’t really that good so not much of a gain. There are a number of great classic books you can download from the Guttenberg project, this may save you from purchasing a few paper books. Some of my more technical books have received free Kindle updates when the author chooses to update the text. This is a benefit in my mind. 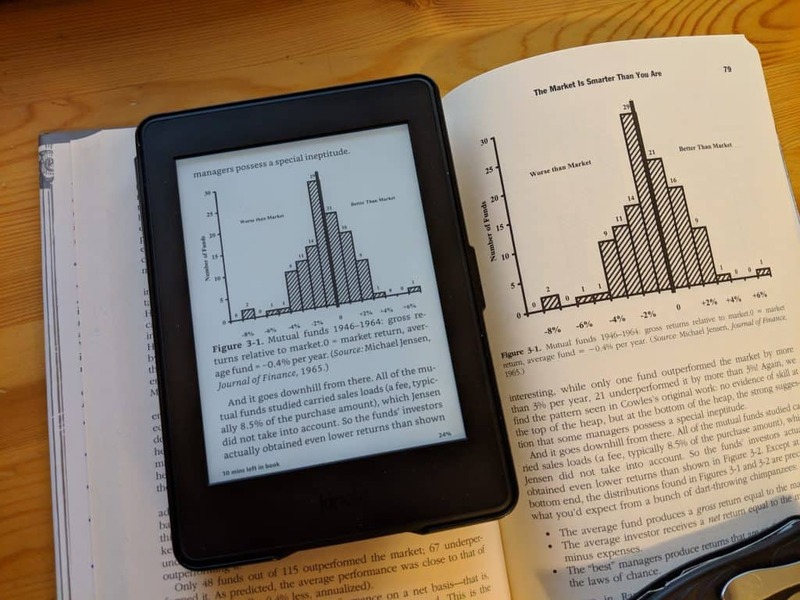 I think it would be better if the Kindle would highlight the differences. One nice feature on the Kindle Paperwhite is the X-Ray. You can enable it for the page you’re on and it will tell you about the characters and give you some context (if you’ve forgotten the previous chapters or missed it). 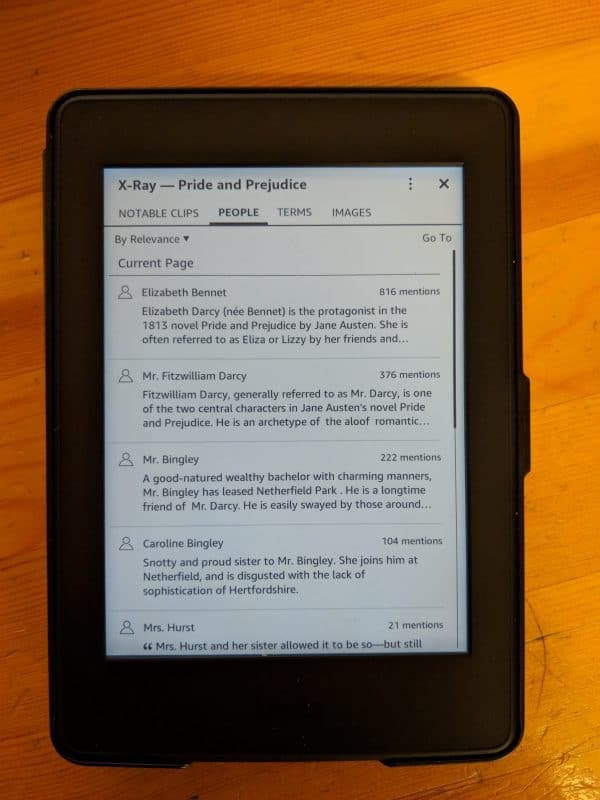 You can read newspapers on the Kindle. But it’s worthless. The Wall Street Journal digital subscription is completely separate from the Wall Street Journal Kindle Digital Subscription. I’m not going to buy a Digital subscription for both my computer and my Kindle. 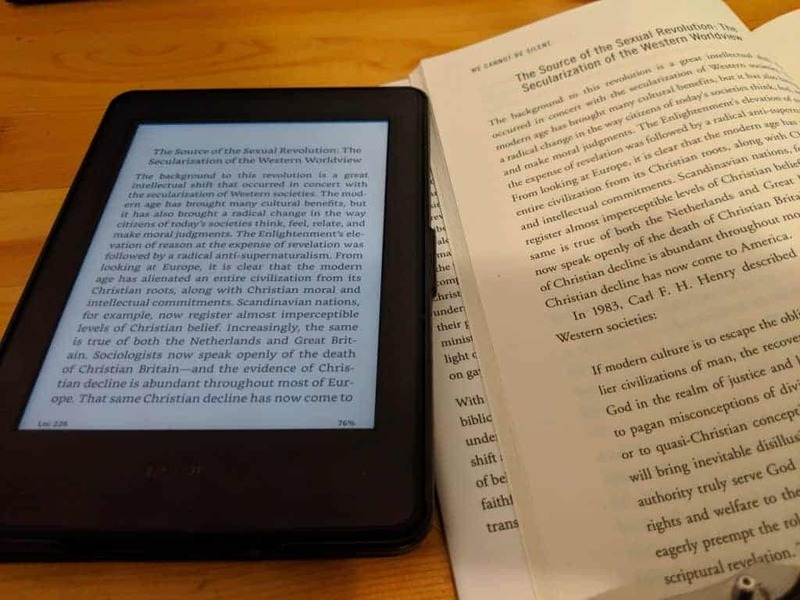 One great thing about eBooks is I can read them on my Kindle, then bring up the book on my computer to review my highlights while typing up notes–but it’s a hit and miss. This works for Amazon books I bought from the Amazon store. But if you buy Kindle formatted books from not Amazon there’s no way to get them to open up in the Kindle for PC program (even though they are available in Kindle for Android). Very annoying. So, What’s Better? Kindle eBooks or Old Fashioned Physical Books? It really depends. I like both for different reasons. I do have a preference for Print Books and mostly because I can visually track progress and visually see the layout of pages and flip through them. Generally if it’s a book I’ll probably read once I’ll just get what is cheaper… but obviously some I’m going to insist on getting the physical version. One feature that Amazon does for /some/ books is if you buy a physical, you can get the Kindle version for free, or heavily discounted. I do hope that this becomes standard practice going forward–that’s the best of both worlds. Of making many books there is no end, and much study is a weariness of the flesh. The end of the matter; all has been heard. Fear God and keep his commandments, for this is the whole duty of man. For God will bring every deed into judgment, with every secret thing, whether good or evil.